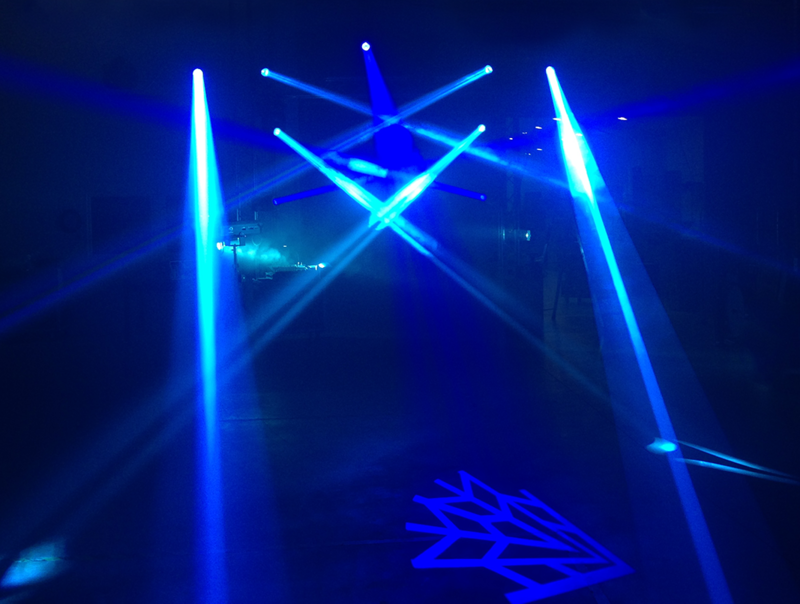 The Tour Hazer II is controlled by two DMX channels. So it is possible to control the internal fan and the Haze-Output independently. With the help of the fan of the Haze produced can be widely distributed in the venue, and it does not require C02 or anything similar for operation. Oily residues belong to the past. Thanks to the high-quality water-based Tour Hazer fluid you need not worry about residue on stage or in other equipment. Save yourself the time on cleaning and concentrate on the essentials. Create the perfect light show for your guests to marvel about. Thanks to the closed and robust hose system inside the Tour Hazer it can be tilted and operated on eather side. If you want to direct the haze directly towards the ground, it does not matter if it is laying on its side or completely upside down. Only the side where the air vent is located should remain exposed, and the direction of the haze can easily be changed due to the 45° adjustable air baffle. Just a little bit more to connect. Thanks to the PowerCon TRUE1 connector, short cables are a thing of the past. If necessary, you can easily connect a longer cable with a PowerCon TRUE1 plug. Neutrik connectors are known for their extreme robustness and reliability. The locking system prevents accidental removal of the plug while connected to the power source and eliminates the danger of shock. Since the first version in 2000, the Tour Hazer has been developed for mobile use utilizing robust components and a case that contains all required materials which can withstand the impact of a fall from a loading dock. Plug it in and let the show begin. 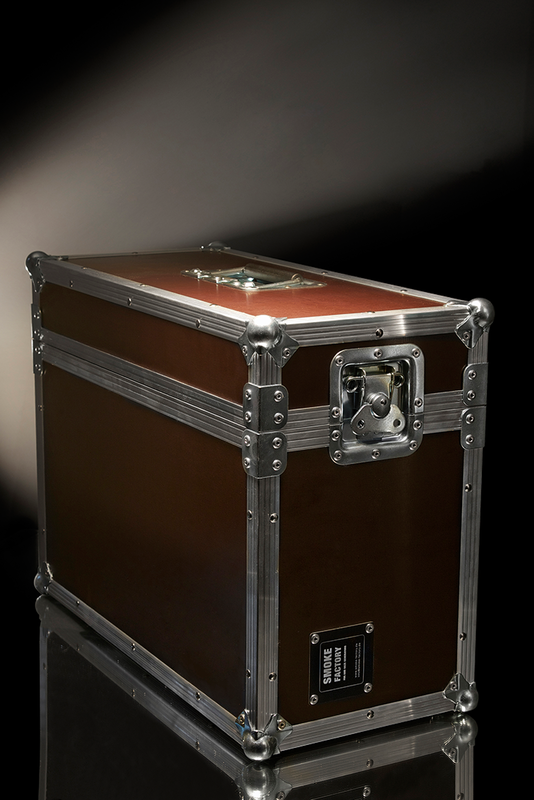 Since 2006, the Tour Hazer has been available in the „Standard Case“ or „Vintage Look“ version. 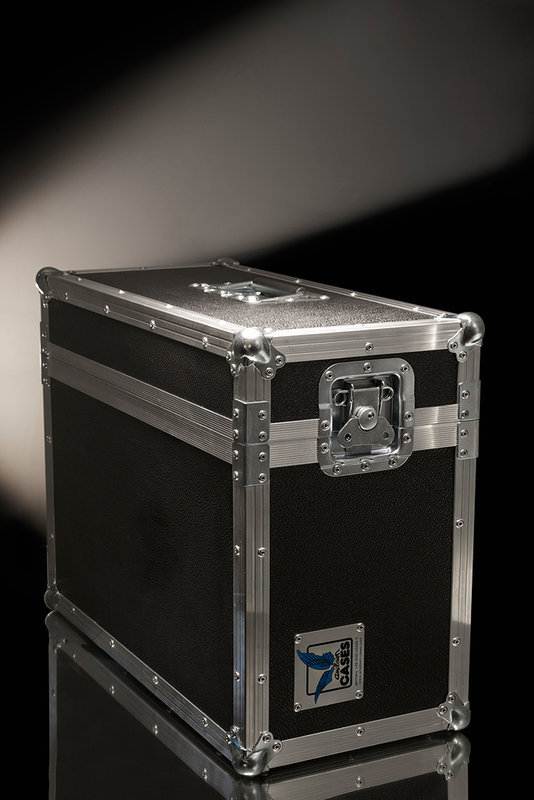 Made in Germany, these cases are ideal to withstand the rugged wear and tear of touring. Reinforced by ball corners and heavy duty hardware, the Tour Hazer is well prepared for transport on tour. Also manufactured in Germany, the Tour Hazer II „SF“ Black comes with black lamination. It is well prepared for tough on stage performances without looking „down rocked“ afterwards. 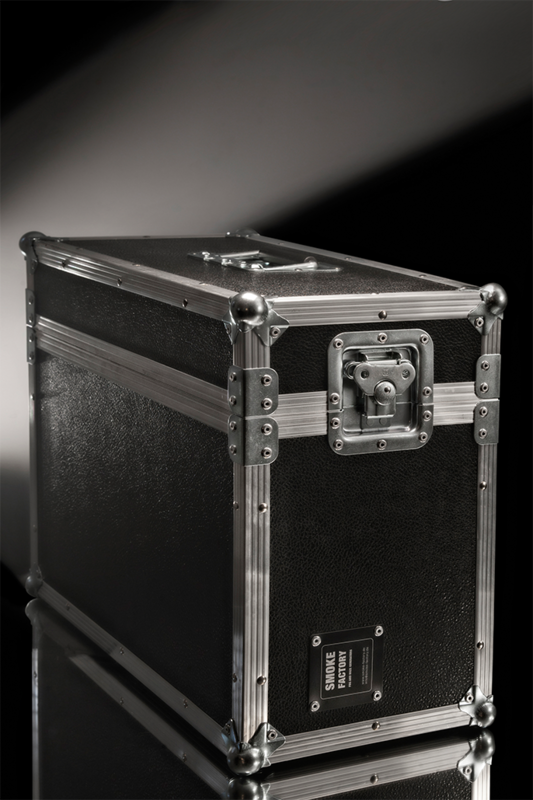 The high-end version of the Tour Hazer II is presented in an Amptown Case. With thicker wood and robust profiles, it is the ideal partner for a world tour or the bulk distributor with more than 300 operating calendar days. Perfect, whether you wish to utilize our Tour Hazer on a large world tour, or as a sole unit on a musical stage. We are flexible. No profiles, no boxed lid. The Tour Hazer in its smallest and simplest version. Ideal for theaters, permanent installations in discotheques, laser tag halls or for mobile DJ’s require no touring unit. The canister slot can accommodate a 3ltr. 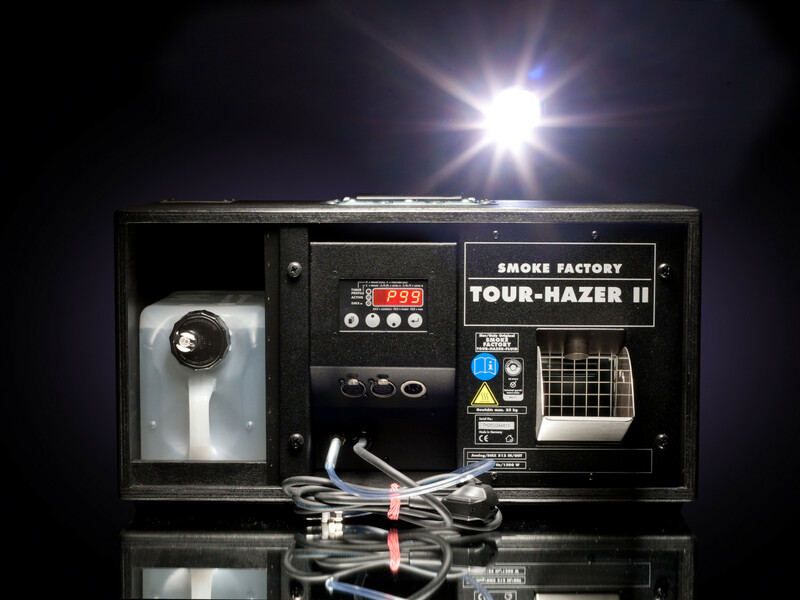 Canister of Tour Hazer fluid which can generate up to 72 hours continuous haze on reduced output. Due to the water-based fluid, a clean production of fine Haze is possible. The special fluid of the Tour Hazer allows us to minimize the consumption of the device. 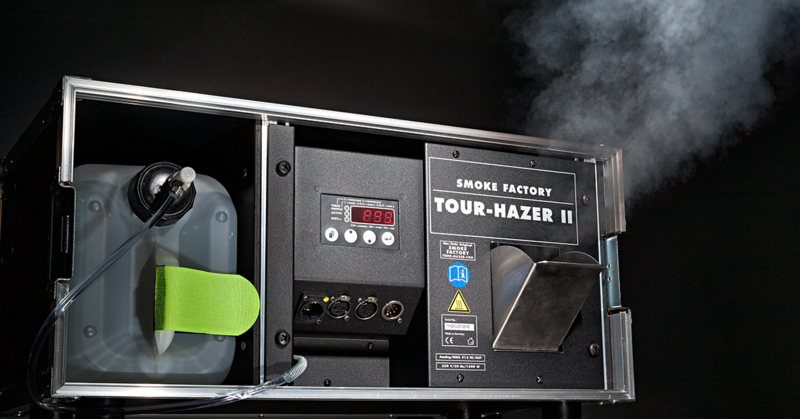 So the Tour Hazer II needs only 1 ml/min for 40% performance. A 5ltr. canister Tour Hazer Fog is therefore sufficient for 83 hours, i.e. 3.5 days of continuous Haze. On a lower setting, running times of up to 5 days of continuous Haze can be achieved with a 5 litre canister. 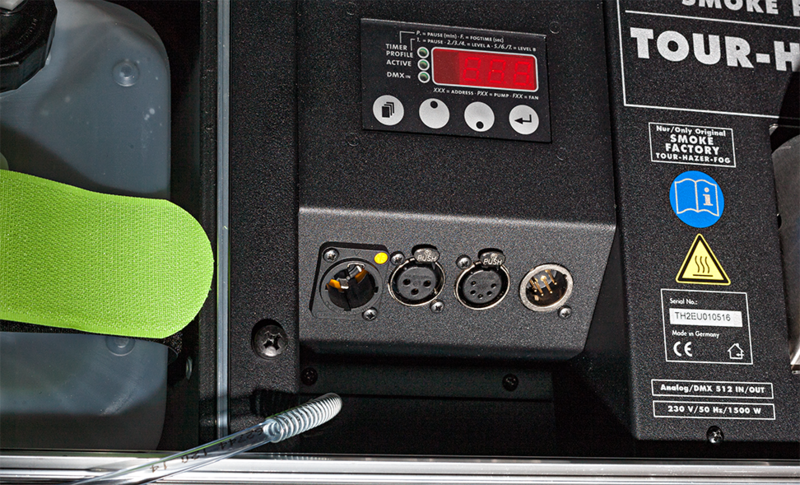 The high-quality components in the Tour Hazer II make an extremely quiet operation possible. The air pump regulates itself automatically during operation, and depending on the amount of fluid consumption the Hazer will operate much quieter. With the Tour Hazer II in “off mode”, it is able to clean itself when the show is finished. The “off mode” can either be started manually or will automatically start after the DMX console is turned off for several seconds activating the built-in air pump to clean the heater and hoses thus ensuring a long life of the components. Do you need more personal and detailed advice? Send us a short email, a brief summary of your question and we will get back to you at your preferred contact method. Just let us know, where you are from and our nearest distributor or the german Smoke Factory staff will get in touch with you. For further Informations, please download the data sheet or manual.